My absence the past few months can be explained…I’ve been crazy about a river. Not just any river, but the Arkansas River near my Sangre de Cristo mountains of southern Colorado. 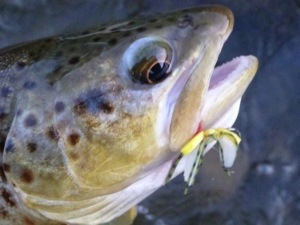 Most fisherman know of the Arkansas for it prolific Mother’s Day caddis hatch, but come run off time she goes largely ignored except for the thousands of thrill-seeking-wet-suited rafters. I’ve spent many hours this summer wandering and pondering the banks of the Arkansas. When not on my river, I’ve been living the new American dream…more hours at work for less money in my pocket. I’m Hope’n for change to come this November 2012! This blog is not and never will be a political one, there’s plenty of them out there. I place my politics with the constitution and in particular the Second Amendment…our constitutional right to take up arms to protect our families and property, etc. Blue grouse season is upon us this Labor Day weekend. I’m heading to the uplands where the sage and aspen edges meet. Plan to work the dogs and fish the mighty Colorado River in the evenings…after the dogs are completely worn out from doing what they were bred to do. We’ve been out on a few scouting sorties and seen grouse. The broods are lower this summer than I can remember from years past. I’m grateful to have made it to another birddog/gunning season! There’ll be plenty of posts here at Setter Feathers & Groused Tales from here on out…promise! 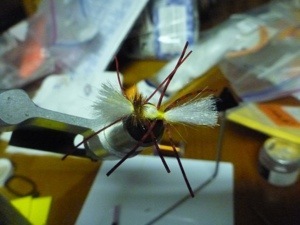 One of the things I took up this summer (and wish I had done years before) is fly tying…it adds a whole new dimension to my fishing! 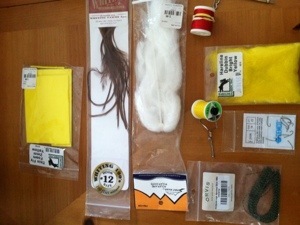 For the past 3 months I’ve only fished with the flies I’ve tied…had great success and some failures too. 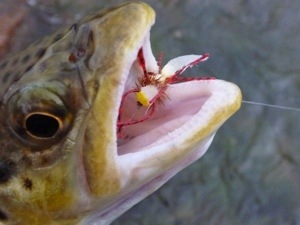 One of my favorite hatches on the Arkansas is the yellow sally stoneflies (Isoperla mormona aka little mormon girls). 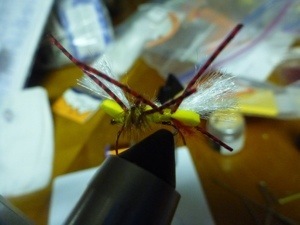 I saw a fly used on the rivers in Oregon and Washington called a Chubby Sally…so, I came up with my own version…hence the title above: Chubby Mormon Girl. 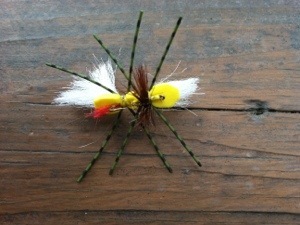 Below are some photos of my rendition of the Chubby Sally of which I added a ginger hackle on the thorax. 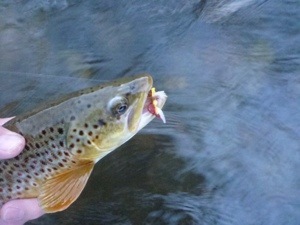 The browns on the Arkansas River go crazy for it during the evening magic hours. Good to see you back posting on here. Looking forward to pictures and stories once bird season gets going. How did Sept 1 get here so fast? Forgot to tell you……..fishing with Joe Guilds on Thursday on the South Branch. Thanks all! Have a great fall and hope you all have many days afield with your birddogs!